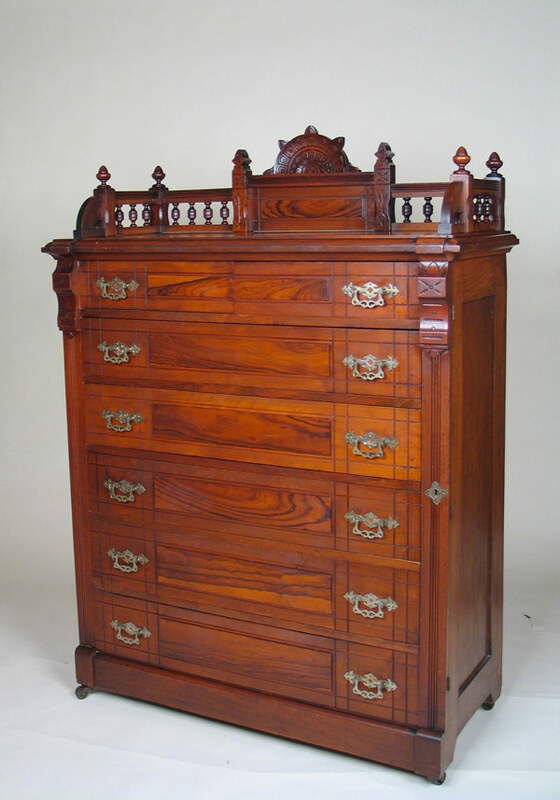 Andrew Frei became a renowned bedstead (see photo) and furniture maker in San Francisco. His road to success was paved with barriers. Born in Switzerland, he was orphaned at the age of nine. He made his journey to America as a young man and eventually established himself as a struggling furniture maker in San Francisco. Four months into the venture he lost everything to a fire that destroyed the uninsured shop. Today he is highly regarded as a master of his craft and his work holds great value to collectors. We are working on a Maker and Manufacturers Index as well as an Index of regional artists to act as a useful tool for people who love antiques. We believe the history behind the artifacts of the past adds to our appreciation of their value to us today. Certainly, many of the stories that led to the rise (and sometimes the fall) of early manufacturers and makers, are interesting and inspiring. Imagine building a business without the conveniences we now enjoy – picture transport by sailing ships, infrequent and slow trains and cross-country wagons. Rudimentary and unreliable communication systems, the constant threat a fire that could entirely destroy a manufacturer’s building and inventory, the scarcity of materials and so many more real, physical barriers to innovation. And still, because of their perseverance to succeed we collect their work today. Theirs is a triumph of will, talent and determination. Throughout our years as antique appraisers in Sacramento, San Francisco and Northern California, we’ve handled work by most of the Makers listed below. We are always interested in learning more – so, if you can offer a new Maker for our Index we will welcome the input. Our Directories will always be a work-in-progress. Charles M. Plum & CO.
Fifth Street Furniture Manufacturing Co.
George C. Flint & CO.
Jonas G. Clarke & Co.
William J. Heney & Co.